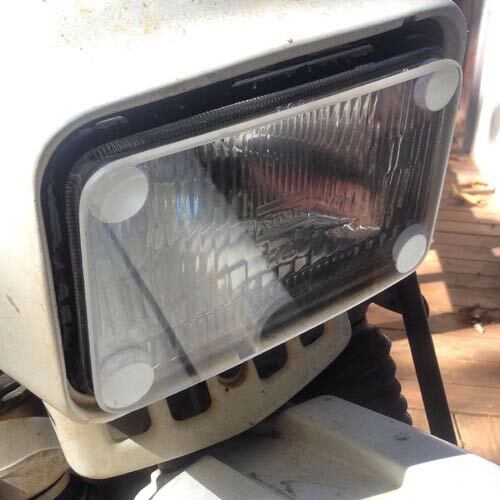 After too many personal dual sport adventure rides ending with expensive broken headlights, Parabellum Ltd. has designed headlight covers for dual sport bikes. These headlight guards, made of military aircraft grade 3/16 inch cast acrylic, protect vulnerable headlights from rocks, roost, branches and mud. These covers take the hit so your headlight does not. Optical clarity of the cast acrylic ensures headlight brightness and projection are minimally effected while impact and abrasion properties ensure headlights will survive through gravel and rock impacts. These guards are held securely to the headlight with an industrial strength hook and loop Velcro system. Shipping outside the U.S. must be calculated for each country.